Manama : Amidst the achievements of Bahraini women receiving global spotlight, it emerged that women constitute a majority of the government workforce. Fifty-three per cent of the public sector employees are women although they lag behind men in the private sector, it is learnt. The statistics and opinions were shared by a panel consisting of Shaikh Mohammed bin Essa Al Khalifa, Political and Economic Advisor to HRH the Crown Prince’s Court and Chairman of Tamkeen, Zayed Al Zayani, Minister of Commerce, Industry and Tourism, and Khalid Al Rumaihi, CE of the Economic Development Board (EDB) during an event held at Ritz Carlton Bahrain yesterday. The event was organised by C5 Accelerate and its Executive Director Hadyah Fathalla hosted the panel discussion. According to the panel, achievements of Bahraini women are commendable and all government initiatives to empower women have borne fruits. They said the lower participation of women in the workforce had been because of various reasons, such as cultural reasons and personal choice. While discrimination may exist, it is not particularly high in Bahrain when compared to developed countries, they said. Speaking on the occasion, Mr Al Zayani encouraged women to take full advantage of the opportunities that exist in Bahrain. 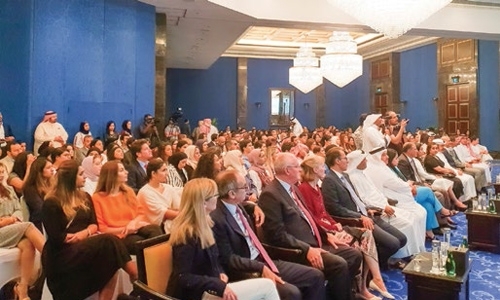 Shaikh Mohammed added that nobody including women should be denied opportunities for discriminatory reasons, however, he emphasised that meritocracy should be followed to ensure efficiency. The event is part of C5 Accelerate’s Nebula initiative for women’s empowerment. Previously, as part of Nebula, an essay competition that invited female students and professionals to explore technology’s potential for greater gender equality and women’s empowerment was held.